I think that I’m not exaggerating by saying that every conversation about “collaboration” last week started from the Google Wave announcement on the Google I/O conference last week. I’ve seen many initial feedbacks in CAD/PDM/PLM related communities and spoke to many colleagues. I think that the majority of people were excited by being able to introduce a new way of collaboration and the potential impact Google Wave can make on Product Lifecycle Management. I’d like to point to a few comments from non-PLM communities. One was made by Dion Hinchcliffe about enterprise implication of Google Wave. Another one came from Stephen Arnold “A Surprising Ripple for Wave in the SharePoint Ocean”. I’d recommend you read both. I’d like to take a look at how to improve PLM collaboration by comparing two approaches I found very fundamental and different. One came from the success of Microsoft SharePoint and the second from the initial presentation of Google Wave. Although I understand that it’s hard to compare something that exists and is successful with something that is new, fresh from an announcement, I’ll try anyway. Here’s my short summary of how I see the SharePoint-based collaboration without going into much detail. The core of SharePoint collaboration is a List and Folders mechanism that can be used by people working on specific documents, activities, groups and organizations. Where <List> is something that is mostly oriented on tabular data (think about a shared Excel file), <Folder> is something more oriented towards working with various documents. You can go beyond the basic list and folders by organizing them into <Workspaces>, <Sites> and <Site collections>. So far, this very successful collaboration model, in my opinion, allows people to share data and files and work together. The most important addition is the very seamless connection to the Exchange Server that allows you to associate lists and folders with email accounts and get inbound and outbound messages directly into folders. So, you want to collaborate? Define what you want to collaborate on, setup workspaces and folders, and share information and/or collaborate with the people you need. Seamless integration with Office products makes conversations between Excel and List/Folders in SharePoint easy. As I understand from the many announcements, information, video and other materials (I haven’t had a chance to try out Google Wave myself), the fundamental collaboration model of Google Wave is a definition of Wave. The core definition in Google Wave collaboration is a threaded conversation <Wave> and a set of <Wavelets>. These <Wavelets> are combined with something called <Blips>. The interesting part starts when Blip can actually reuse any type of available web resource – Mail, Wiki, Pictures, Blogs etc. There are two ways to enhance this model by providing Gadgets and Robots. Gadget enhances client appearance for a wavelet (i.e. connects to Facebook or other collaboration sites) and Robot can support potential functionality on a server (i.e. online translation). Below is a summary of my preliminary thoughts on how these two models can evolve. The strong point of SharePoint model is that it starts from content (list, folder, excel etc.) This model is strong in enterprise in general, but also has Product Lifecycle Management roots. Your Bill of Materials, List of Documents etc. are in the general list of information. Also, Office/Excel/Email integration adds a lot of additional benefits to this model. The SharePoint list model tries to resolve the email mess when you are trying to find multiple threads of communication. But this model still cannot provide, in my view, a good solution for that, since even if you route all messages to the list according to your rules, you still end-up with lists you need to track – so this is still similar to a mailbox. The Wave model has many strong points by allowing you to connect dots in a threaded conversation and communication. So, you can follow each topic about which you are collaborating and then you’re always up-to-speed about what’s going on. On the content side, I see that the Google Wave model is still weak and does not present capabilities to be connected to the popular data views in the enterprise. My conclusion for now is that it will be very interesting to see how both models will evolve separately and cross-influence. I see a great potential in both models and see an opportunity to mix them as well. I’m looking forward to hear your comments and thoughts on this. Excelent point to compare SharePoint and Wave. I am still under the excitement of this new product and here is a couple of thoughts about what you wrote. – In term of edition, Gdocuments is more than sufficient for a company like valeo to envisage to only use them. I have no doubts that it will be integrated in wave. I didn’t want to stress out relationship to OSS, since this is turns discussion in different directions. But, I agree, Wave could be good collaboration platform for the future. – Best. Oleg. personally, I’ve never liked sharepoint too much. I stopped using it after nightmares with administrating it and dealing with IT. Also, it’s not a readily accessible app, which is where we come with Wave (which I’ve only seen hands-on demos/write-ups on). There’s two important points there though. Microsoft has the capability to use the real-time web and Wave (Google) is going to have to allow communication with other apps/protocols – email, IM, SMS, etc. Looking at this from a PLM/CAD perspective into the future, the innovation all starts with bits of text. It’s all 1 and 0’s right? If we can do this with email, why not with product data and geometry next? Thanks for your view! You provided very interesting observation with regards to SharePoint. I’d expect MS folks to come and ask you more questions :). Collaboration is about to work together on “something”. This “something” is Wave in GW and List/Folder with MOSS. BTW MOSS is not about Exchange. It can be connected to Exchange/mail, but this is not the core. If we will put current PDM/PLM, SharePoint and Wave on the scale of ability to collaborate on “structure”, you will see PLM and Wave on the opposite sides and SharePoint somewhere in between. Product Data and Geometry are more complex. How do you expect them to appear in GW-like style? Google is already getting to the real-time collab stage within google docs. you’ll see when someone else is editing the doc you’re working on. the same could go for product data and geometry. not that we’ll be fighting over extrudes and cuts, pushing and pulling each others geometry till the wee hours of the night, but that real-time generation of features can be views on each others screen (via broswer). When product meta-data and properties are created, added changed, revised, this all happens as someone review, works in an assembly or in a production planning environment. It integrates seamlessly, being completely open, with other database apps that can viewed via web, mobile, with no need of relying on people to make sure the data gets transfered to the right system. Really, the geometry could control everything, be the interface for the process from design to manufacturing. apologies if this is a bit rambling. 🙂 I get going with this stuff. see ya. Josh. excellent thoughts! I will try to make it more granular for the purpose of this discussion. Google Apps capabilities are clear. Even if I had no chance to play around GW, Google Apps/Docs show potential. 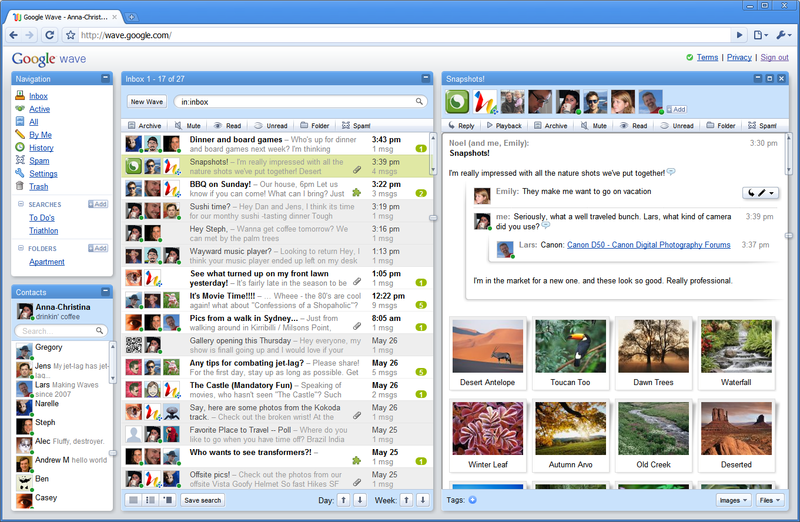 You can take a look on my post – http://plmtwine.com/2009/05/28/options-to-streamline-plm-collaboration-microsoft-vs-google/. 1. From collaboration on 3D: I think 3DLive conceptually doing the same. Do you agree? Have you had chance to see it? 2. On meta-data: I can understand ability to search all data, but how do you see collaboration on meta-data editing. Are you going to co-edit attributes? Do you see it more in connection of document and other unstructured data editing. 3. You last point -sounds like a great future!